My name is Ann Carter. I’m an extremely sensitive psychic medium. I opened up in 1999 after walking into a past life that hit me directly in the face and challenged my deep rooted belief system. I was conditioned to believe a bunch of things that no longer serve me. It was drilled into my head that you only live one lifetime, and you will end up in one place or another based on what you believe today. I was told that anyone who calls themselves a psychic must be dark and of the devil. Now I know that nothing could be farther from the truth. 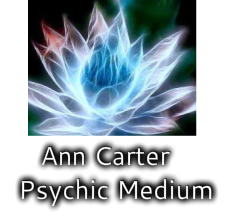 I help others communicate with their guides and angels by being a psychic medium! I have been on a learning journey since 1999 and will always remain a student, open to learning. After working under a few mentors for a couple of years, now I have a large client base for whom I read, I work of off referrals, and I do private and group readings. I also hold workshops and offer a variety of classes on various spiritual-growth topics. My passion is to help others with their own spiritual awakenings. I know we are not alone; many spirits are around us all the time. You know this is true because sometimes you feel it too. I know angels are real. They assist me with readings, helping me to communicate the words you need to hear, words that will resonate with you. I know we are all here for a reason. Sometimes we step off our path, but then we feel a pull to do something that leads us to get back on that path. I want to help you with living true to your path, to help you get back on track with your souls purpose. I am now more of a spiritual person that I have ever been. Every day is a gift and every day I have the opportunity to grow the light around us all. Love is the strongest emotion and with love, you can connect with your guides, your loved ones on the other side and the angels assigned to you. I would be honored to help you on that journey.